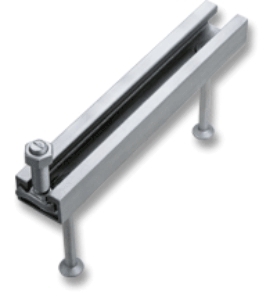 HALFEN SHEAR DOWEL SYSTEM is a high load shear connector system to support floor slabs at movement joints. 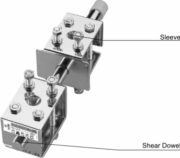 Each part of the HALFEN SHEAR DOWEL SYSTEM whether the sleeve or the dowel, is supplied complete with support box and vertical anchor rods allowing high shear loads to be transferred efficiently between concrete members. 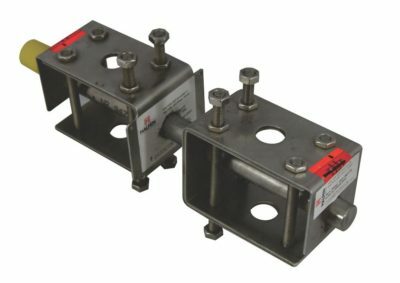 The sleeve load connector system allows for movement by sliding of the dowel inside the sleeve. In addition the sleeve in the first pour may be oval shaped which allows for lateral/transverse movement while still taking the full vertical load. The support box and sleeve (either round or oval) are nailed to the formwork and cast into the first pour. The formwork is stripped and the dowel pin and its support box are inserted ready for the second pour. Design gap and full material specified by others. All components are grade 316 stainless steel. HALFEN SHEAR DOWEL SYSTEMS are suitable for loads ranging from 50kN. A guide to the most common sizes is given in the table below. For greater loads please contact Joluka. The effects of – shrinkage – temperature – creep in case of post-tensioning – subsidence require constructive measures in large supporting frameworks. Movement joints prevent the uncontrolled formation of cracks and the subsequent damage that arises from this as a result of leakage and corrosion. * Simple geometry of the formation of the joint. * Simpe formwork and time saving installation. * Gain in space through avoidance of double supports. * Cost saving and gain in space through staged erection of the construction elements.